Johannes Winlicenus was born on June 24, 1835 in Kleineichsted, Saxony, the son of Gustav and Emilie Winlicenus. He was born into a devout protestant family that in the 17th century had been forced to flee their native Poland to Saxony on account of their religion. His father was a protestant minister who in 1853 published a book in which he attempted to liberate people from what he thought was a "superstitious adoration" of the Bible. The book was considered blasphemous by the authorities, and so it was destroyed and he was sentenced to two years in prison. Instead he fled with his family to Boston, Massachusetts. Johannes who was 18 at the time served as an assistant to chemist Eben Horsford at Harvard University and in 1855 he as appointed lecturer at New York's Mechanic's Institute. Returning to Europe in 1856 he went to the University of Halle where he resumed his studies and served as an assistant to Wilhelm Heintz. He had finished the requirements for his PhD by 1859 but as a condition of his graduation he was asked to renounce the teachings of his father and cease his political activities. He refused and then went to the University of Zurich where he finished his doctorate in 1860. He served as a lecturer at the University of Zurich until 1868 when he became a professor of chemistry there. In 1860 he became professor of chemistry at the Swiss Pyrotechnical Institute and he served both professorships simultaneously. In 1872 he became the chair of chemistry at the University of Wurzburg and in 1885 he became a professor of chemistry at the University of Leipzig. Winlicenus' research was in organic chemistry. Starting in 1868 he began studying lactic acid. Lactic acid is a carboxylic acid that is a metabolite of glucose. In his studies he found that there were two types of lactic acid which had different chemical properties. While these two chemicals have the same chemical formula (the same numbers and types of atoms) they have different structures. In the case of lactic acid (a three carbon long carboxylic acid) one form has a hydroxyl group attached to the carbon adjacent to the carbonyl carbon and the other form has a hydroxyl group attached to the terminal carbon, the carbon on the opposite end of the three carbon chain from the carbonyl. Because these two molecules have different structures they have different properties, but the formulas for both compounds are both C3H6O3. Winlicenus called these chemicals with the same formula but different structures structural isomers. Another important experiment carried out by Winlicenus, working in collaboration with his friend Aldolf Fick a professor of physiology at the University of Zurich, showed that carbohydrates and fats were the principal source of muscular energy. The pair ascended the Faulhorn, taking with them only food from which proteins had been excluded. While they climbed the pair monitored their nitrogen metabolism and found that the the break down of proteins accounted for less than one third of the energy generated by their metabolism. 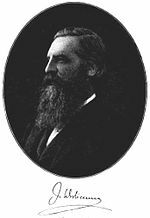 Wislicenus was elected a foreign member of the British Royal Chemical Society in 1888 and member of the Royal Society of London in 1897 which presented him with its Davy Medal in the following year. Winlicenus died on December 5, 1902.